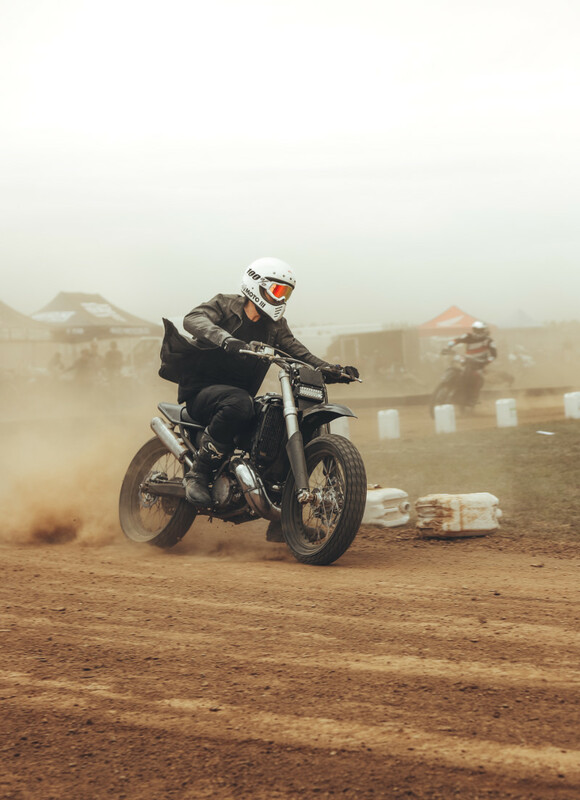 The KTM 300 EXC is a weapon — a street-legal, two-stroke enduro with a 51-hp liquid-cooled engine and dry weight of just 225 pounds. 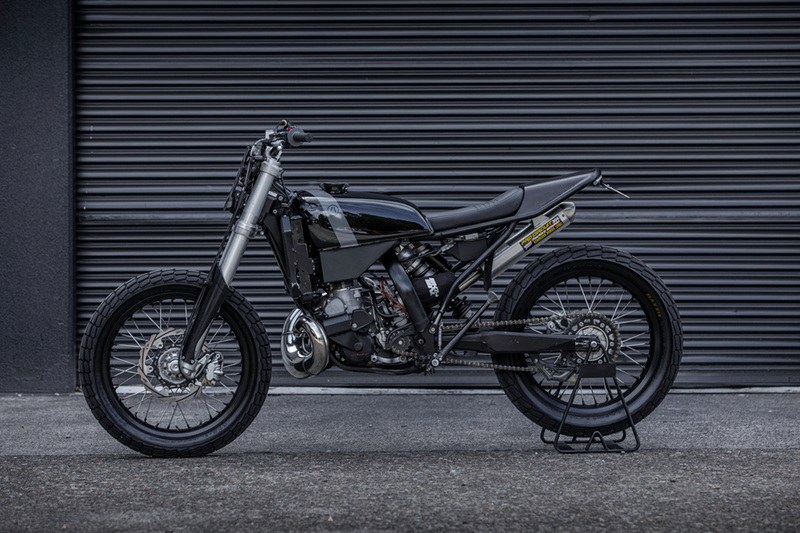 The bike has electric start, fully adjustable suspension, and a reported top speed of 120 mph. It’s difficult to imagine a better — or more fun — platform for the street, trail, and track. 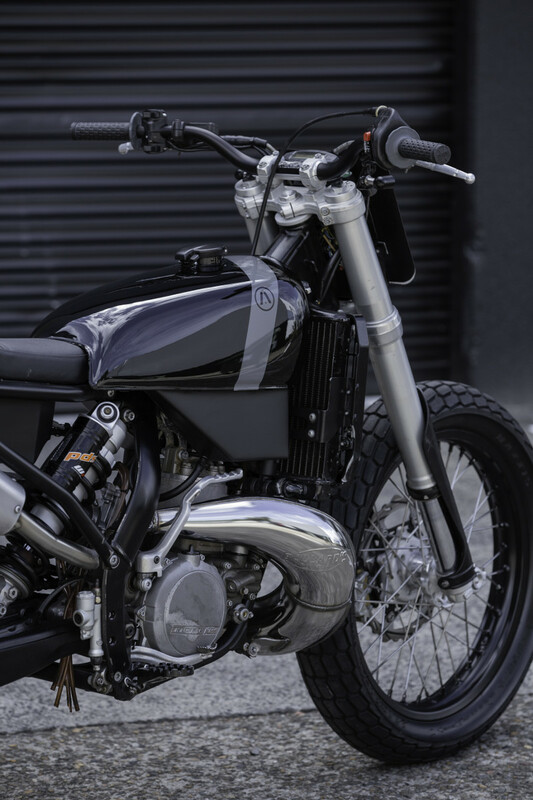 Originally, Max planned to build the bike up in Queensland, starting with a Yamaha RD350. However, then he talked to his friend Nigel Petrie of Engineered to Slide. 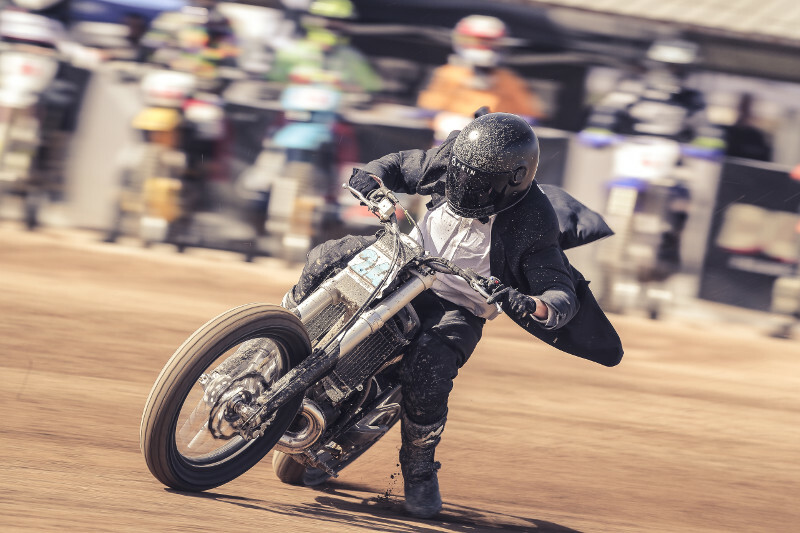 Nigel is one of our favorite builders and the star of the incredible film FLATS, in which he pursues his boyhood dream of setting a land-speed record on a hand-built 350cc KTM Salt Flat Racer. Nigel convinced Max to led him build his dream bike. 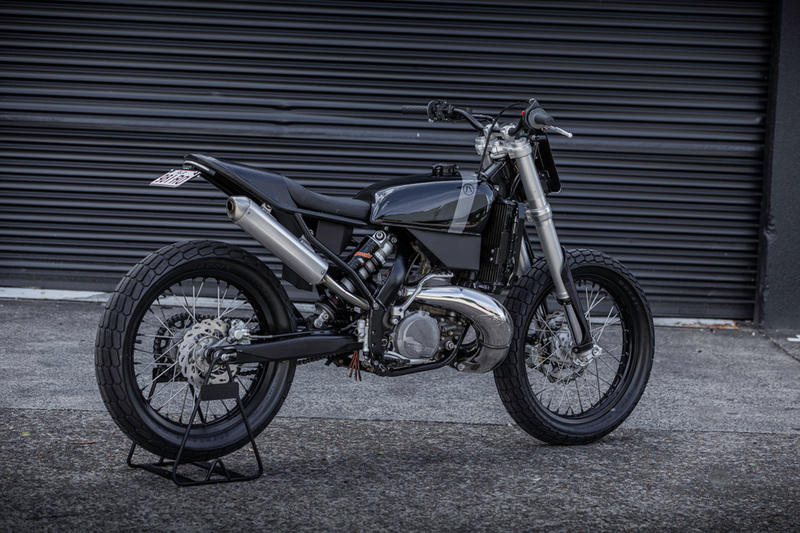 After seeing Nigel’s KTM 250 “HiRider” tracker build, he decided a KTM 300 EXC would be the perfect donor bike. 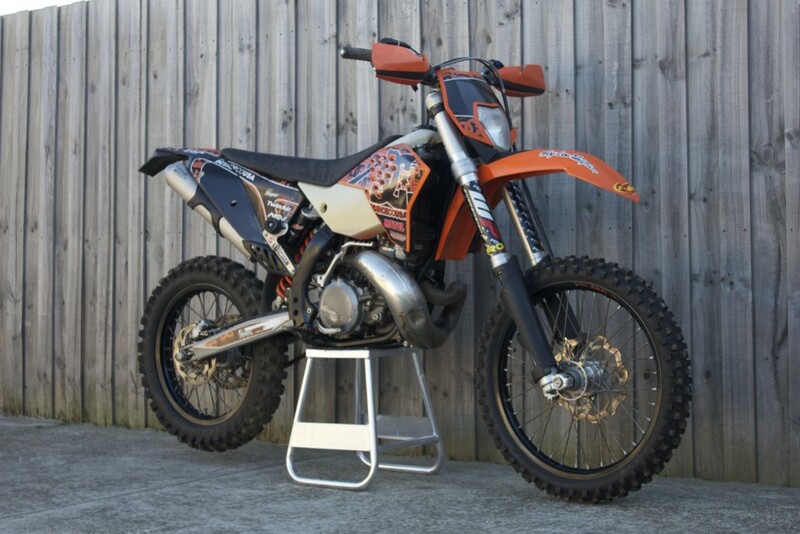 Nigel located a low-hour 2011 KTM 300 EXC — the first year to receive the desired 6-speed gearbox and other upgrades. 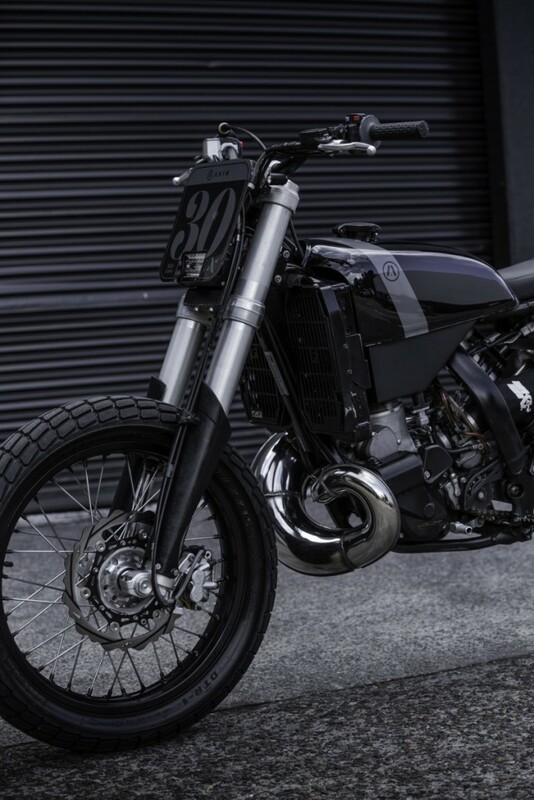 He stripped down the bike and put the unneeded wheels, plastics, and other accessories in a “stock components” box — Nigel doesn’t cut anything on these KTM builds, so the owner can reverse the process if ever desired. 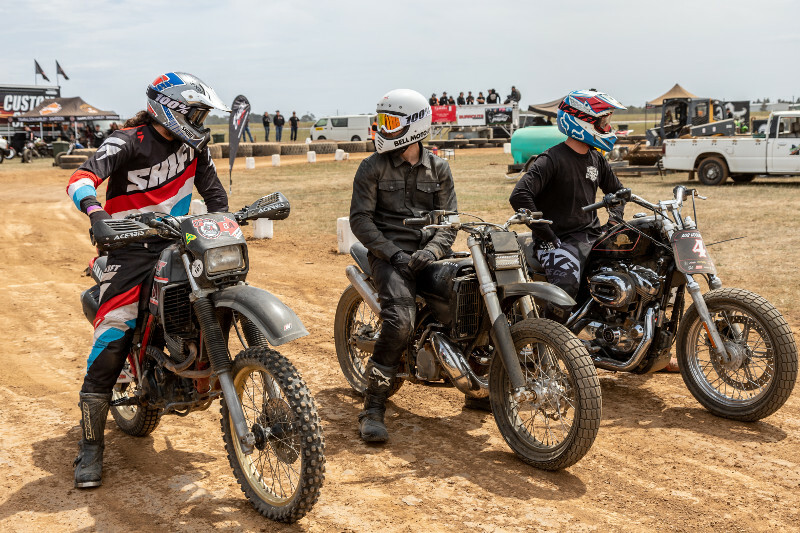 He worked out the geometry to make the bike stable at high-speed, taking 125mm from the front and 135mm from the rear, and fitted a vintage Honda tank, with reliefs for the radiators, extra fuel capacity, and a Caswell bladder / sealer kit. 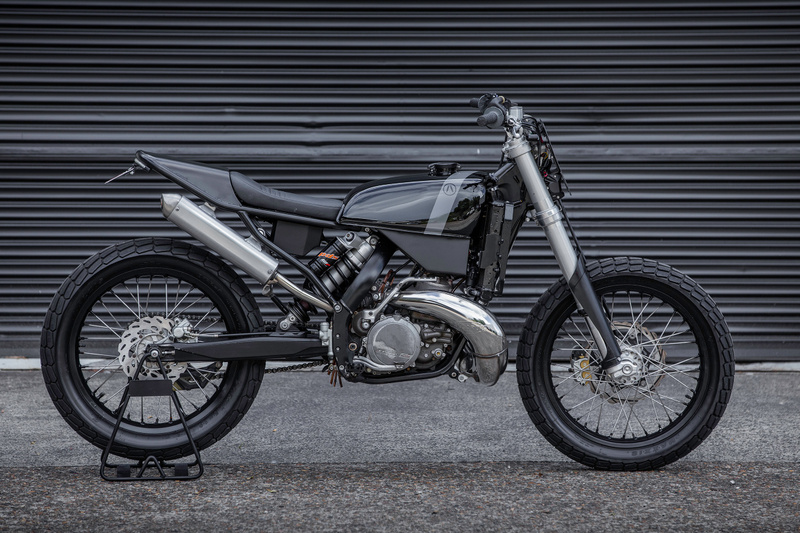 He built a custom frame from 1-inch chromoly with a tail inspired by the Indian FTR1200 and custom electronics/battery box. 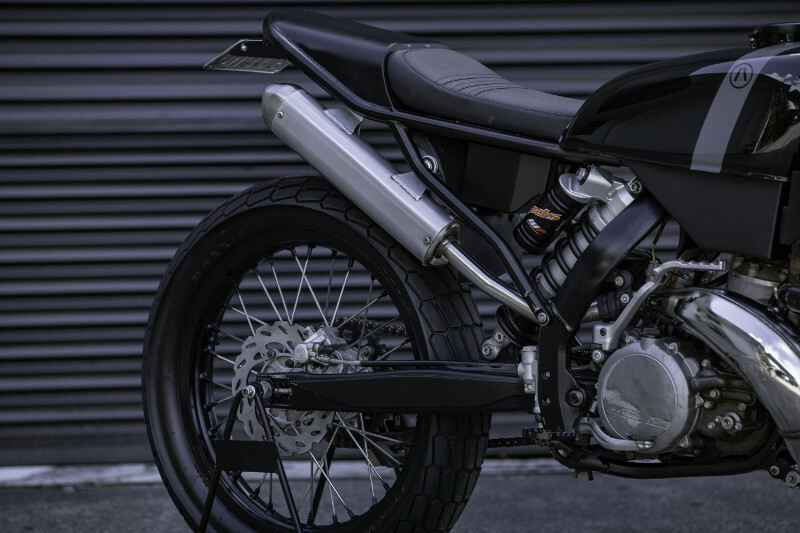 Up front, he added an LED Spot/Flood light in a custom alloy 3mm surround that “keeps the bike simple and stylish while being purposeful and a little different.” You can find more of Nigel’s detailed build notes here. 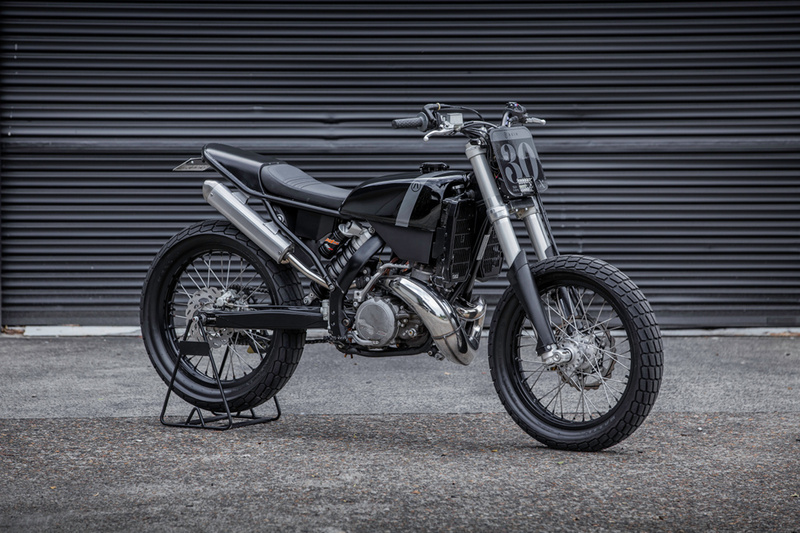 The result is one of the most stunning two-stroke street trackers we’ve ever seen. And, unlike most such builds, this one gets used both on the street and the track. 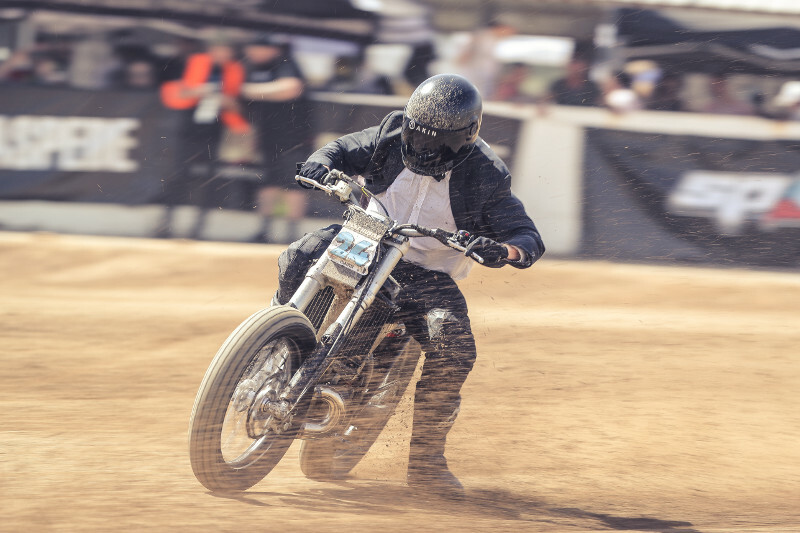 As you can see in the photos, Max isn’t afraid to wring this ripper around the track. 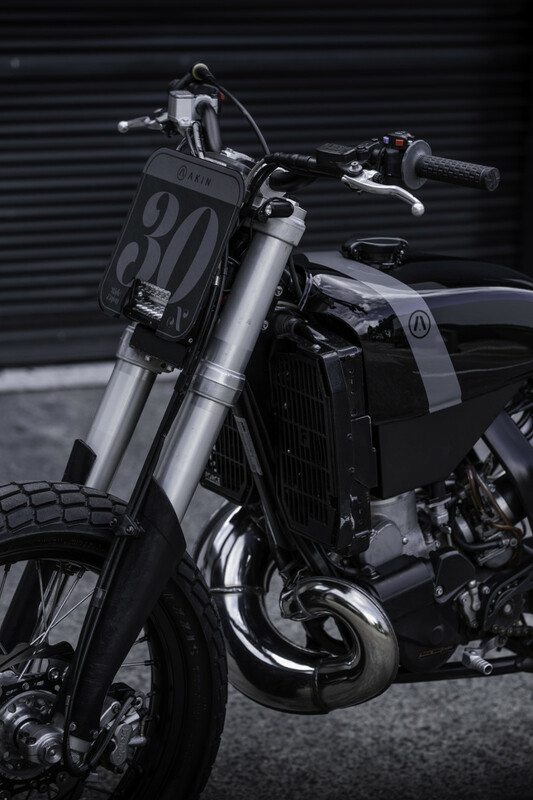 Below, we get the full story on this staggering build. 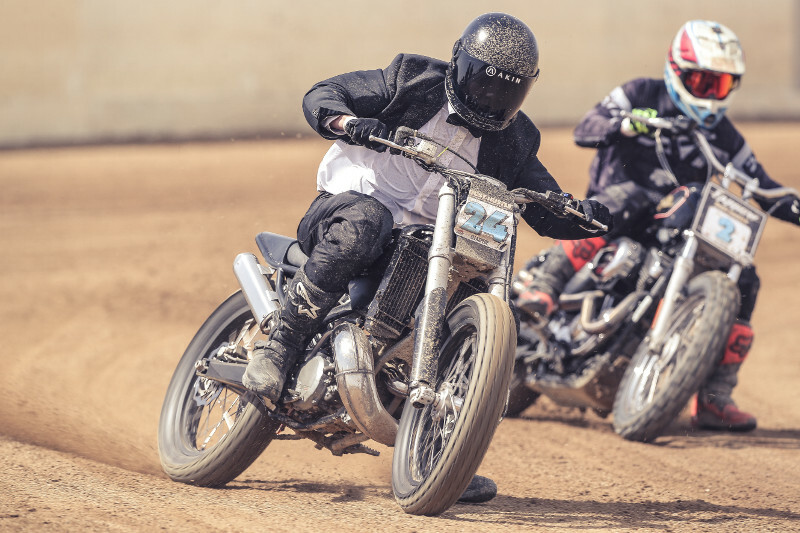 Growing up, I was absolutely obsessed with Motocross and action sports. This obsession led to a dream of one day owning a two stroke motocross bike. 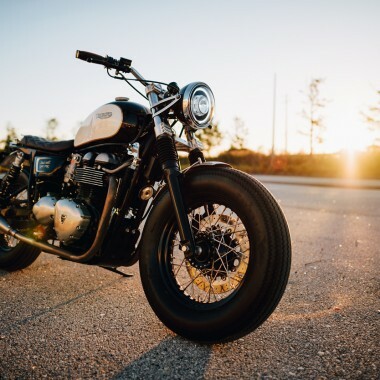 Unfortunately, my family was never in an appropriate financial position to support my passion for motorcycles (we had a crusty old farm bike though!). 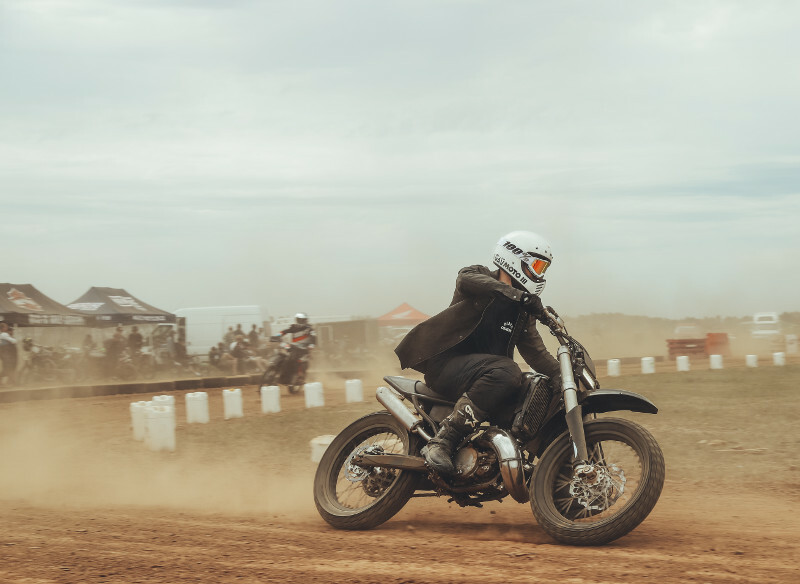 Fast forward 20-something years and the passion is still strong – having worked in the action sports industry and starting two brands of my own: Death Collective and Akin Moto. 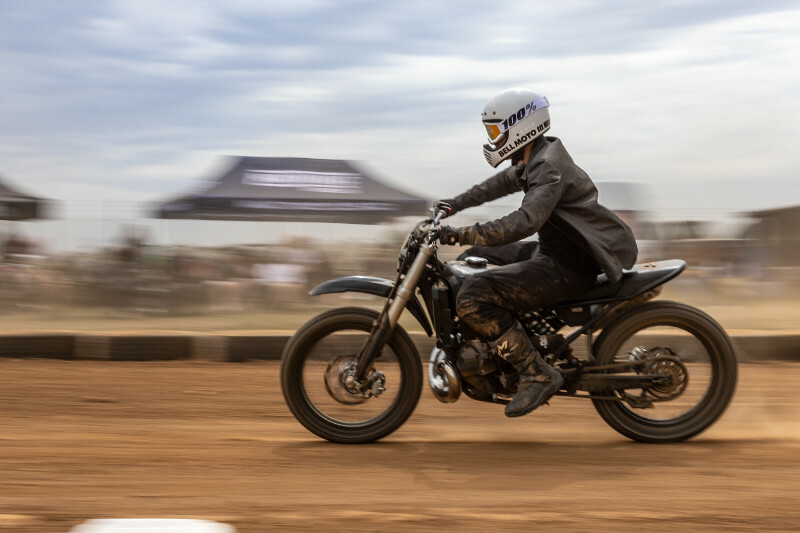 This bike was a dream build, but would also be used as promotional tool for Akin Moto – my riding gear brand. 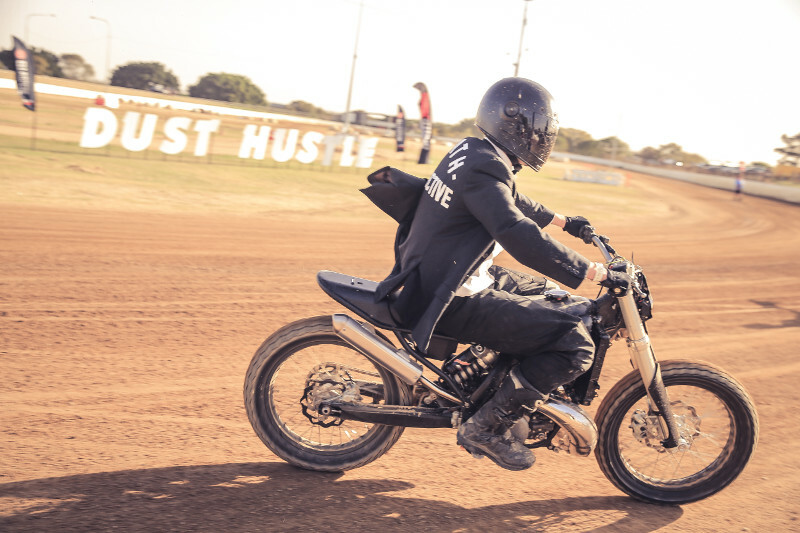 The bike needed to be ready to race at Dust Hustle, Day in the Dirt and Aus Hooligan X. Luckily, Nigel is a fast worker and had the bike delivered to me well before the Dust Hustle event! Stoked! 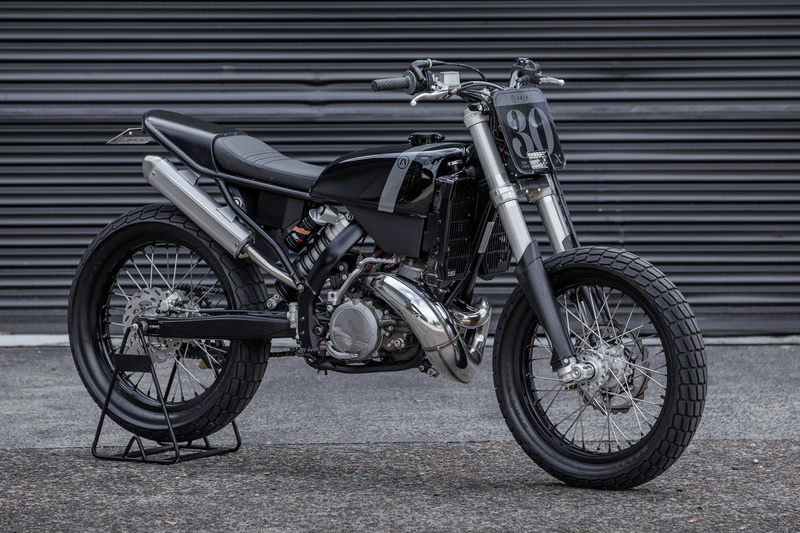 I’ve always wanted an angry 2-stroke that can be legally ridden on the road. You just don’t see them that often and there’s nothing like the glorious sound and smell that comes from a 2-stroke! 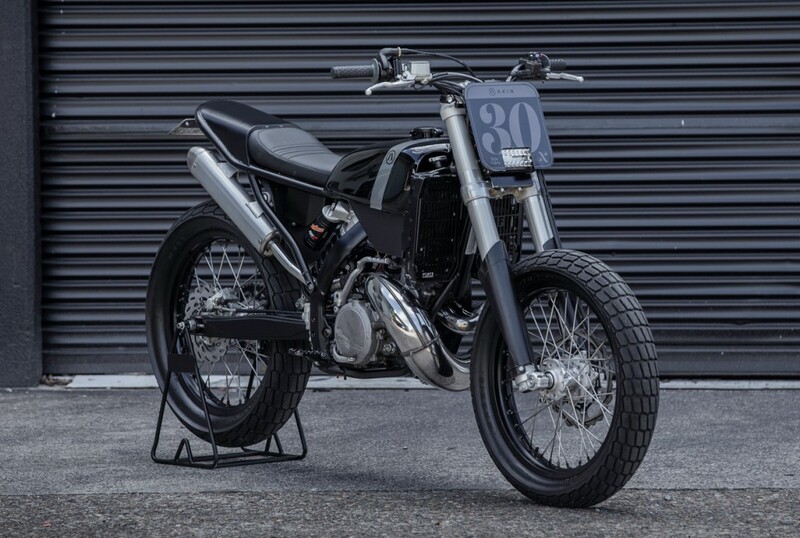 Initially I was thinking of using an RD350, but after seeing Nigel’s KTM tracker build, I decided that a KTM 300exc would be the perfect donor. I guess you could say that the biggest influence on the overall build, was the builder himself. 2 Stroke street tracker…. That actually gets used on the street AND the track. 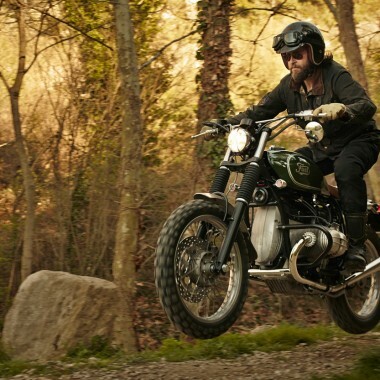 I’m just proud to own a bike that Nigel has built. He’s an absolute wizard and we share very similar approach and appreciation for minimal and functional design. Thanks for this piece! I too, am nuts for two strokes on the street. I have a 300 KTM stroker and a 400 RD. 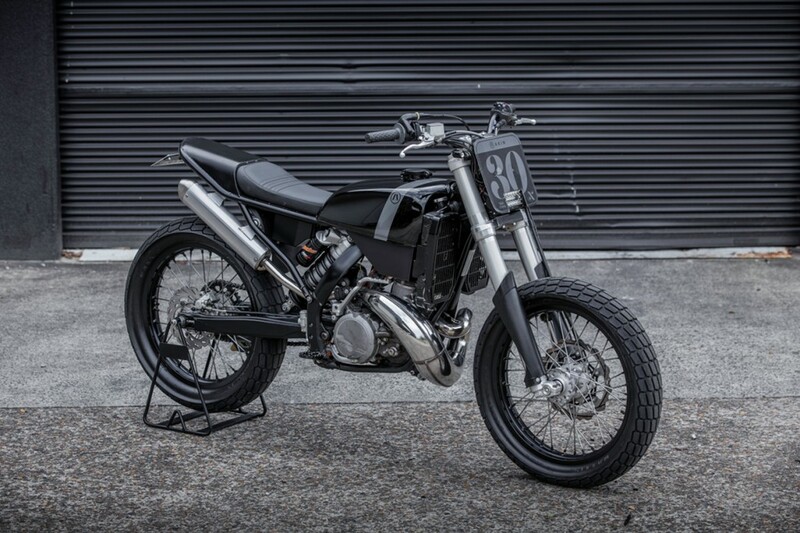 I’ve been wanting to make my KTM street legal too! Loud and stinky! 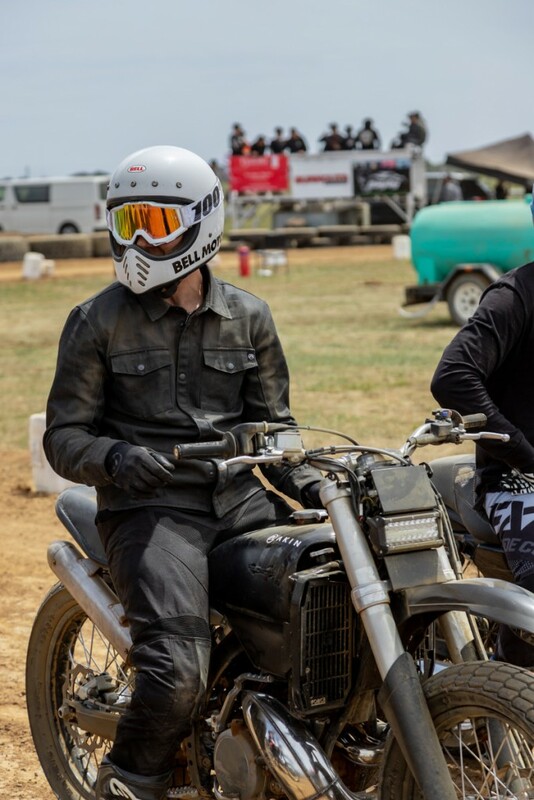 Roll 2-stroke mafia!